I found this in one of the many great used bookstores in Winnipeg. I picked it up because the small hardcover was so attractive and because it was written by the author of The Taking of Pelham 123. It turned out to be well worth the $7.00 I paid and will look great on my shelf as well. That Snake is based on a great concept that is fully thought out, both scientifically and the supposition about how New York City would react to a giant, deadly snake in Central Park. I don't know if it is me, as it confirms my existing bias, but this book seemed savagely critical of New Yorkers and humans in general. 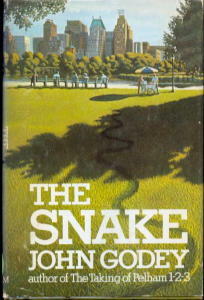 Hysteria and blind selfishness seem like the defining factors of most of the people but the snake and the protagonists. It all seemed quite realistic to me. Depressingly enjoyable. This is the story of a dissolute journalist who goes to the wilds of northern Michigan (and they actually do sound quite wild) to interview an old engineer who worked on large-scale projects (dams and the like) in developing countries during his youth. It's a manly, richly-written that I enjoyed reading, but it's also one of those novels that doesn't really have a plot and my simple mind doesn't know what to make of it by the end. I think it's an exploration of living a life and the choices we make. It has an excellent attitude and is really well-written (and also has a good reputation) so I suggest you check it out as well.